The LED Dimmer Control Switch is designed for use on all Roadvision Next Generation Light Bars – allowing you to change the brightness of the lights to suit changing conditions (from 50% to 100% output), without affecting the light colour. Turn your lights down if there’s a bit of traffic around, and turn them up for maximum brightness. The Dimmer Control Switch is easy to install with plug and play technology and is suitable for positive or negative switched head lamp systems. Find a suitable flat location on the dash to mount the Dimmer Controller. If required pre-drill a hole for the cable to pass through the dash or alternatively pass the cable through an existing opening. Using either the 3M double sided tape, or M4 screws, fix the controller bracket to the dash. Pass the two wires through a grommet in the vehicle firewall making sure the cables will not rub on any sharp edges. 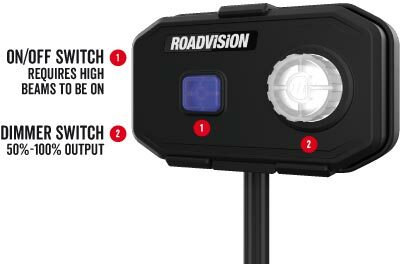 Connect the 4 pin LEDLinkTM twist lock plug to the matching socket from your Roadvision Next Generation LED Light Bar. For vehicles fitted with HB3 or H4 bulbs, plug the relevant piggy back connector into the high beam lead from the dimmer controller. (part numbers; HB3 – RPBCHB3 or H4 – RPBCH4 both sold separately). Unplug the vehicles head lamp plug (high beam) from the back of one of the head lamp bulbs and plug the piggy back connector into both the globe and vehicle harness. For vehicles where a piggy back connector cannot be installed, identify the positive high beam feed and connect the red wire, connect the black wire to the negative feed to the high beam. Ensure to solder or use an appropriate crimp terminal and insulate the bare wires with heat shrink or electrical tape. 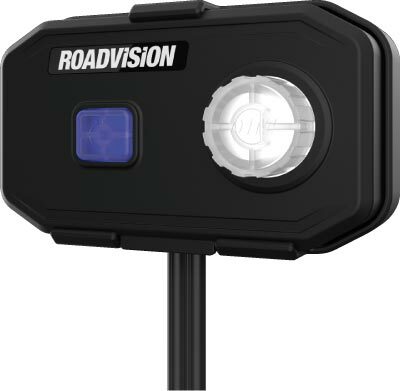 Connect the Roadvision Next Generation light bars 2 pin Deutsch or ATP plug directly to the battery with an appropriate fuse installed on the positive feed. (part numbers; Deutsch – RPCDT3M or ATP – RPCATP3M both sold separately). Secure all access wire to the vehicle. Turn On the vehicle ignition and high beams ON. ON/OFF switch (1) will illuminate Blue on Dimmer Controller, unit is in standby mode. Push the ON/OFF (1) switch to turn light bar ON, ON/OFF switch & dimmer knob (2) will illuminate white when ON. With light bar ON, rotate dimmer knob (2) clockwise to increase brightness, counter clockwise to decrease brightness.